My favorite part about going to the Book Expo was being able to wonder around the exhibit room and find publishers that I wasn't as familiar with. I really enjoyed exploring the aisles and checking out new book titles. One publisher's booth that I came across belonged to Nomad Press. Their booth was a little piece of Heaven on earth for me - being that I love history and intend to homeschool my kids. But even if I didn't plan to homeschool my kids - I would still be a big fan of these books and would look for ways to utilize them in my own time and in my own way. Why? Because they are fantastic! Do you want to introduce your children to different time periods in history and help them to understand what it would be like to live in a different era? Look no further. Filled with craft activities, geography lessons, vocabulary lessons to fit the history lesson, fun facts and - of course! - history itself, these books offer a marvelous opportunity to delve into our past. 1. 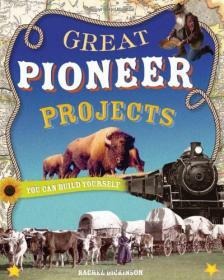 Great Pioneer Projects You Can Build Yourself - Earmarked for ages 9-12, this book contains a variety of activities which range from easy to more difficult. (You can make your study as engaging as you like!) There are some fun ideas, such as creating and having the children go on a treasure hunt. As the book notes, "Many pioneers were following directions written in guidebooks giving information about where the trail went, where the good places were for water and grass, where rivers needed to be crossed, etc." It could be tricky getting to where they needed to be, so the idea behind the hunt is to make the children to recognize what the pioneers were up against! 2. Explore Colonial America! : 25 Great Projects, Activities, Experiments is designed for children ages 6-9. I really liked this book for the simplicity it offers in teaching the youngest generation how our country came to be. It includes basic maps of the original 13 Colonies that you can copy and have your children color. 3. 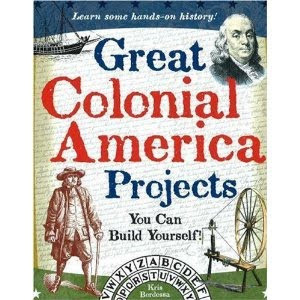 For the older kids, they also provide Great Colonial America Projects You Can Build Yourself! which, again, is designed for ages 9-12. This title provides a more in depth look at early colonial life, offering "Spotlights on Famous Colonists." The crafts and projects are more age appropriate. A time line is also laid out so that you can get a clear picture of what significant events happened and in what time frame. As you can see, Nomad Press offers a variety of books through which you can explore your world - both the past and the present. The nice thing is, they make it easier for you to explore the world, by making their books available on Amazon (which I know is how most of us order our books!) You can also order from Nomad Press. This contest will be open through Thursday, July 1st and is open to U.S. Residents only. Again, I think these books are probably going to hold the most appeal to home school moms. However, any parent could find a good way to put these books to use, especially during the upcoming summer holidays. Learning doesn't just happen in the classroom - and that's true no matter who you are! Here's to making learning fun! I think I might pick Ancient Greece. That is the timeline that N1 is going to be studying this coming year in 1st grade and what a fun compliment! Well now!! You know my love for history AND that we home school. We're studying Early Am. History this fall so I think Explore Colonial America would work great with what I already have planned!! Colonial Homes (coming out in Sept.) also looks REALLY fun for my K and 2nd graders!! I'm so glad you went to that conference and are now sharing such awesome books with us!! First, I want to say that I discovered your blog several months ago. I'm not even sure how but I have to say that I love reading about good books out there and I appreciate the fact that you review things for many different levels of readers so thanks for sharing your discoveries with us. Next year I'm supposed to be doing a unit on transportation so the "Explore Transportation" would be an excellent source for teaching my kids. I would choose Colonial America for 6-9 year olds. It would be great before making a trip to Willamsburg or Philadelphia. My daughter loves learning about the early days of our nation. This would be perfect. I realized when I went to their site, that I own one of their books! My daughter loves it. I think I wouls pick the energy or anatomy; I'm not a science gal and need help. Of course, I would love all the history ones, lol. I think we have similar tastes...several of the ones I liked showed up in your post. I think the one I really like is Explore Colonial America though. Great World War II projects! These look great--I'm definitely going to have to check them out for our home school! To cut down on choices I only looked at Social Studies, and I want the 25 projects to do with Myths and Legends. That looked really cool. Okay, I could have a much longer list than that, but that's what I'm going to stick with. I would choose the Pioneer Projects! I would love to win any one of the project books for our homeschool co-op. SInce the theme this year is Around the World, perhaps the Africa or the Arctic and Antarctic one would be best. I like the civil War Projects book-my 8 yo son is very into that time period and I think he would like to do some of the projects! I like the Great World War II Project book. Oh, there are too many to choose from! Since my kids are younger, I suppose I would pick the Explore Colonial America for 6-9 year-olds. But the Great Medieval Projects and Kitchen Chemistry look fun too! You're right...how do you pick?! That said, I think I would start with Explor Colonial America just because that is my favorite era in American history. I would like the great colonial america projects. I think it would be a fun way to learn about history. Wow - what a great publisher! We would love ANY of their titles in our house. Explore Winter looks great, and I think that would be a fun one to do with my younger kids. Although...I am bit partial to Colonial America...choices,choices...I will stick with Explore Winter. Amazing Africa Projects looks great. Not only are we big history buffs in our family, but we also have some good friends moving to Central Africa later this year! I love the freedom that we have in homeschooling to tailor our teaching to our lifestyles and our kids! It's not history, but, the Human Body book looks great. I would choose Ancient Romans. I do have a great fondness for reading about them. I'd probably pick Great Civil War Projects You Can Build Yourself. Thanks for the giveaway! I would choose Kitchen Chemistry!!! I am about to start my teaching career. I am so excited!!! I'd pick the Amazing Kitchen Chemistry projects. Now I'm seeing that the person above me also picked that. My second would be Explore Solar System. The Greece or Rome one's would be awesome. So would the medieval one, too. I can't pick! A lot of these books look great. I would select the Amazing Leonardo da Vinci Inventions You Can Build Yourself for my boys. They would love this. I would choose Great Medieval Projects You Can Build Yourself! We homeschool and will be studying about "the ancients" so would pick Ancient Greeks. Neat books and post. Thanks!